A well presented, spacious 3/4 bedroom detached bungalow in sought after village. Family bathroom with shower cubicle, bath, basin, wc. There is an integral garage (18`8 x 8`7 or 5.69 x 2.62m) which has access to a large loft space. Rear garden. Gas central heating system. COSTS: Reservation Fee £1200, becomes first months rent on move in. Reference Fee £60 inc VAT per person. Tenancy Agreement £120 inc VAT. Schedule of Condition £210 inc VAT. Damage Deposit £1800. This property is marketed by Mullucks - Part of Hunters, Saffron Walden - Lettings at £1,200 per month. Rightmove has calculated the price per week for comparison purposes only. Property reference 28639729. The information displayed about this property comprises a property advertisement. Rightmove.co.uk makes no warranty as to the accuracy or completeness of the advertisement or any linked or associated information, and Rightmove has no control over the content. This property advertisement does not constitute property particulars. 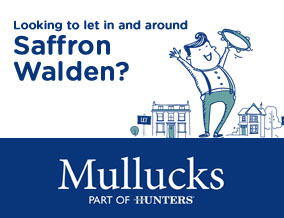 The information is provided and maintained by Mullucks - Part of Hunters, Saffron Walden - Lettings.